Officially licensed and made in Canada. 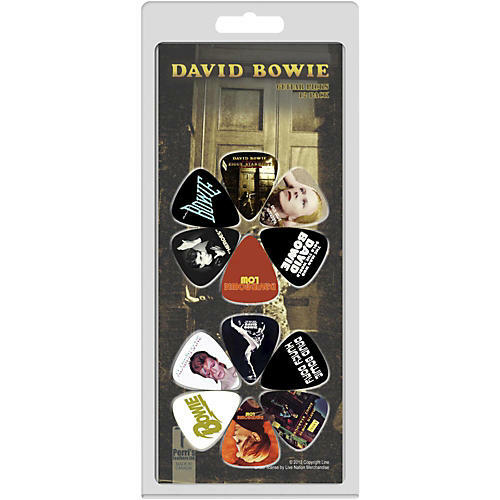 This 12 Pack of digital printed picks offers artwork from albums: The Rise and The Fall Of Ziggy Stardust and The Spiders From Mars ( commonly referred to as just "Ziggy Stardust" 1972. Also Hunky Dory (1971), Heroes (1977), The Man Who Sold The World (1970), LOW (1977), Let's Dance (1983), Aladdin Sane (1973). The picks are all medium gauge and made from Celluloid plastic. Official Licensed Products and Made In Canada.